I thought you might appreciate hearing my AMSOIL story. When the opportunity arose last year to purchase my mother-in-law's 1987 Cadillac DeVille, I jumped at the chance. A true low mileage survivor, it was in near pristine condition. I was proudly showing it off to a mechanic friend when he said, "Uh-oh, you bought an HT-4100? Good luck buddy." After much research I understood what he meant. 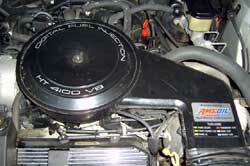 The HT-4100 was rumored to be one of the most troublesome engines Cadillac ever built. The problems are numerous: an aluminum block with cast iron heads that expand and contract at different rates causing premature head and intake gasket failure, coolant loss into the oil, and finally main and rod bearing failure. They also have a heavily loaded distributor gear, weak timing gears, and sludging issues. My first thought was, if ever an engine needed AMSOIL, it's this one. I first heard about AMSOIL at the old Brohman Dragway in the late 1970s from a fellow racer who swore by it. For the past 10 years, I've used various synthetic oils with favorable results, but never AMSOIL. Then I talked with Dave Mann, the AMSOIL Dealer in my home town, and told him my story. Having spent 19 years as a lubrication specialist with Ford, Dave knows his stuff. He made several recommendations, and shared with me his excellent e-book on motor oils. I also asked around at the Cadillac owners group I belong to, and almost every one of them said, "Don't buy AMSOIL! It's too expensive and won't do you any good. You need this or that oil with this or that additive," and so on. Thanks AMSOIL. By making a superb product that truly does what you say it will do, you've given new life to a sweet old Cadillac, and made a believer out of this devout skeptic.